When you have company news, are your employees comfortable sharing it on social media? Making a case for brand advocacy on social media can be a challenge, despite the opportunities it has to offer. But having the proper policies in place can help. 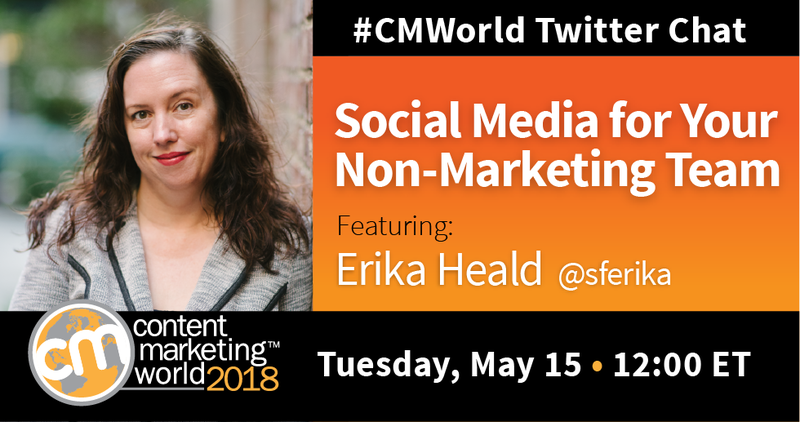 That’s why we invited CMWorld Community Champion Erika Heald to be a special guest on a recent #CMWorld Twitter chat. Erika is a Content Marketing and Social Media Consultant. She walked us through the process involved with creating such policies. How can we make it easy for employees to share brand stories on social? Before getting employees involved on social media, why is it important to set up clear guidelines? We had a great conversation with Erika. You can take a look at more of the chat tweets in this Twitter Moment. Do you have social media guidelines in place? Then take part in our LinkedIn Group discussion. There, you’ll read about how others are handling social media use in their companies. You will also find useful information, including a website that curates policy examples. Join us at Content Marketing World, where we’ll announce the 2018 CMWorld Community Champion. Prices go up on May 31 so register now. Want to save even more money? Use code SM100 at checkout for $100 off.